Please be sure to carefully read the safety information first. Note: Particular care should be taken not to damage/deform the bottom end of the Finbrella’s centre pole. Even slight deformation of the centre pole end (e.g. by impact against the ground) can result in the centre pole being unable to fit over the base/sand pole spigot and to allow free rotation. 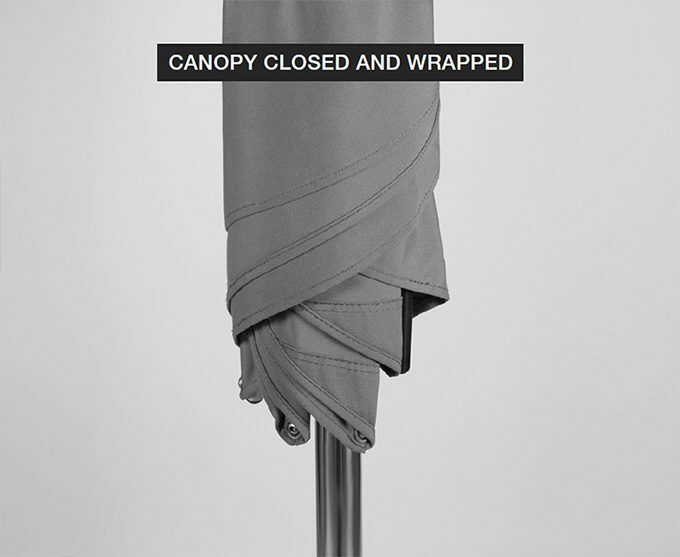 Place the base or sand pole in any chosen location ensuring that the space chosen provides sufficient clearance for the canopy to rotate freely when open (see Safety - Rotation). Sand poles should be buried and packed to a depth of at least 500 mm. Ensure the base/sand pole is positioned vertically and will remain vertical while the Finbrella is open. Note: The Finbrella wind resistance feature will be reduced if the centre pole is not vertical and not at right angle to the wind direction. Slide the Finbrella centre pole down over the base/sand pole spigot. 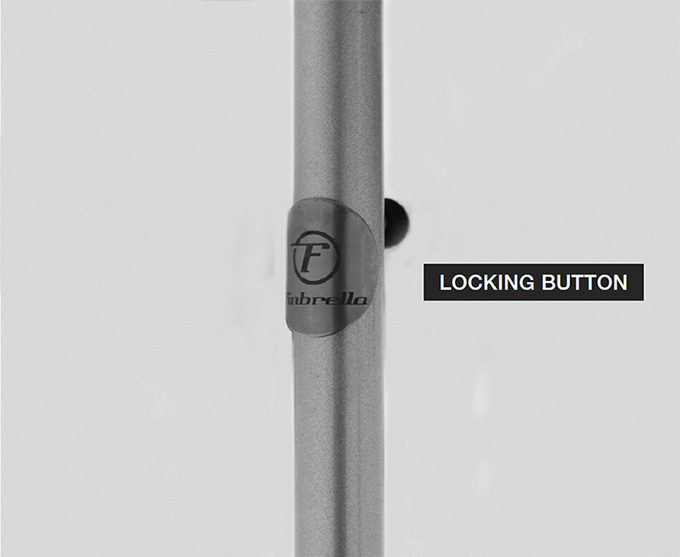 Press the locking mechanism button in to ensure the centre pole locks into position and is sitting on the rotation bush. To open a Finbrella, separate the ribs about 100 mm from the centre post, before trying to raise the runner-hub. The runner-hub should not be forced if it cannot be pushed up easily - continue the rib separation until it can be. 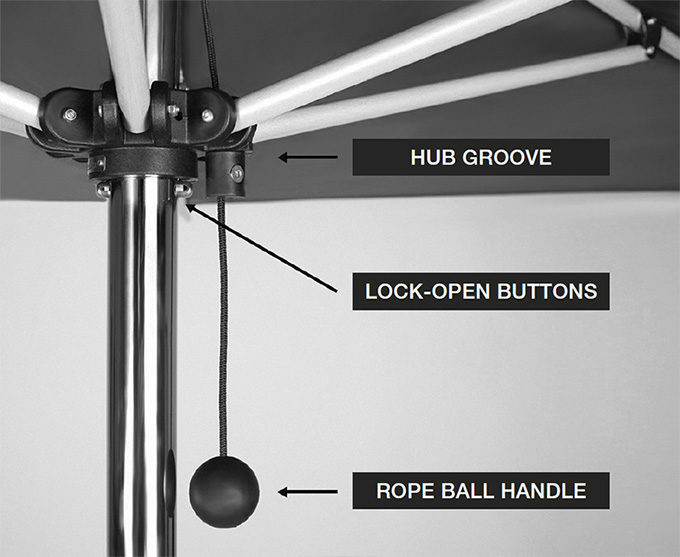 Once the runner-hub can commence to rise easily, push the hub and/or one or two of the rib struts upwards until the hub passes the lock-open buttons. The Finbrella canopy should now be able to freely rotate. Deploy the canopy fin by pulling down on the fin rope ball handle and locking it into its hub groove. Note that the rope lock-washer has been positioned during manufacture so that the end of the flexible fin rib will be set at approximately the same height as the top fixed hub. If for whatever reason the lock-washer does not position the end of the fin rib at this height then the position of the lock washer can be readily adjusted to achieve this required position of the fin rib end. Note: The Finbrella’s special feature of wind resistance is achieved by deploying its fin. 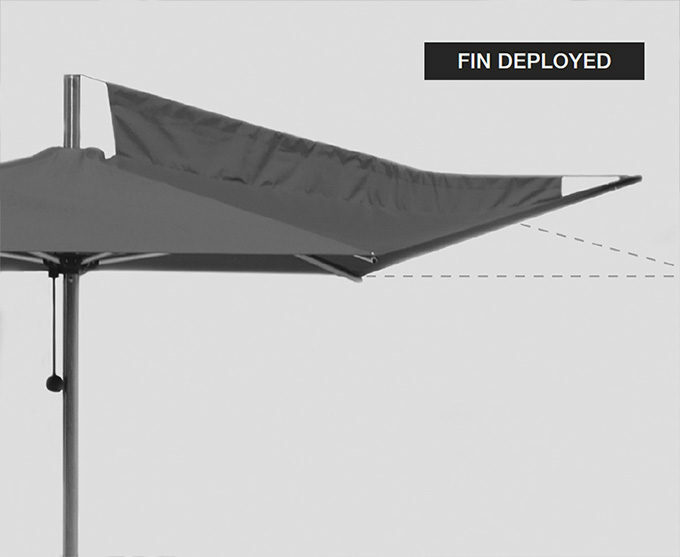 Without the fin set your Finbrella will simply operate like a conventional static umbrella. Before closing the Finbrella ensure that the fin is lowered by releasing the fin-rope from the groove of the runner hub. 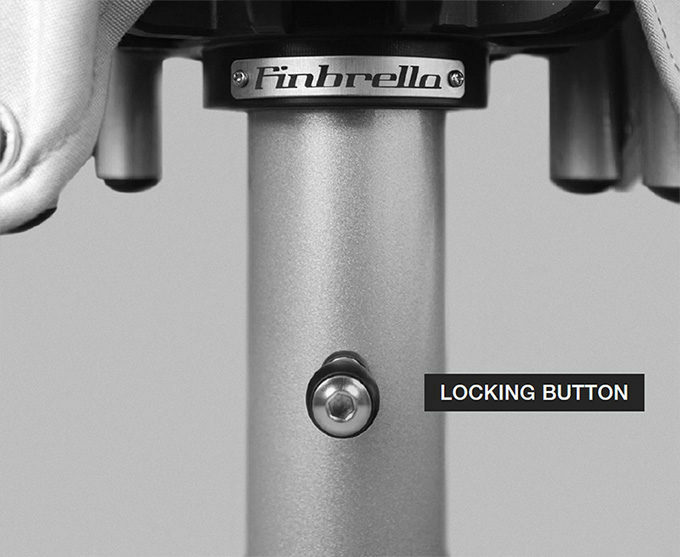 The ribs and canopy can now be lower by depressing the runner hub lock buttons. When lowering the fin and canopy ensure that the canopy fabric does not get caught or pinched between the ribs and struts (note that damage to the canopy caused by pinching is not covered by the product warranty). This is achieved by pulling out and combining the middle of each edge of each of the six canopy sections then wrapping them together around the centre pole and securing with the Velcro tie band. To remove the upper Finbrella section from the base/sand pole, depress the spring loaded locking mechanism button and lift the upper pole past the lock. The upper pole can now be completely lifted off the spigot and separated for storage. Note: Deformation of the centre pole’s lower end (e.g. 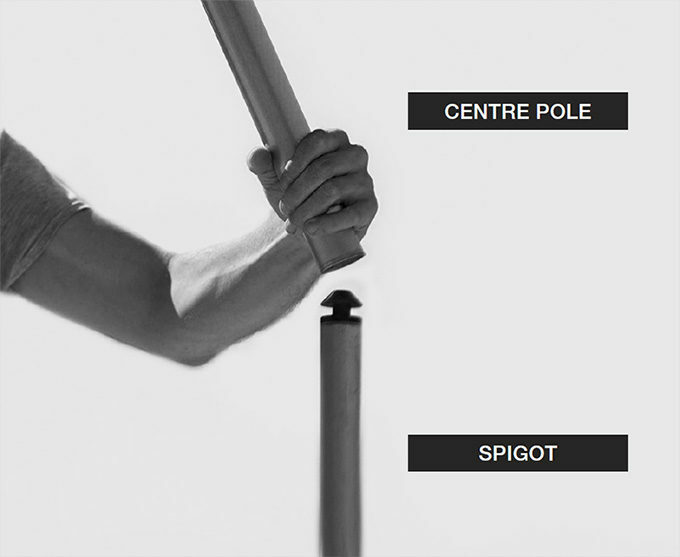 by impact against the ground) can result in the centre pole being unable to fit over the base/sand pole spigot.